Collingham Gardens Children's Nursery is a semi-wild children's nursery garden shaded by tall trees, but it was once part of the burial ground of St George the Martyr and a number of gravestones remain in the garden. In 1877 surgeon Thomas Cooke rented a corner of the disused burial ground for his School of Anatomy, which ran successfully until the 1890s but by the 1920s was derelict. In 1935 it was acquired by wealthy philanthropist John Cyril Lees Collingham, after whom the garden is named, and at his behest a garden for 'the welfare of children' was established. 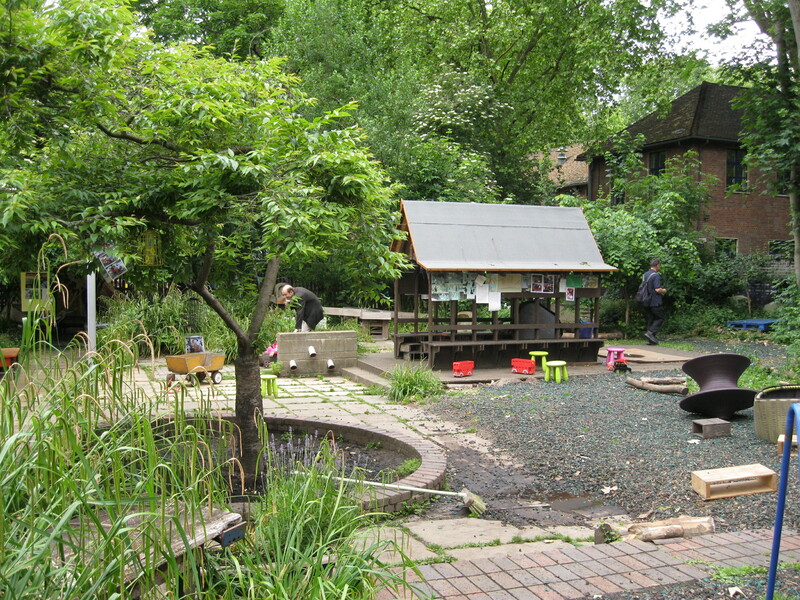 The site has been used as a nursery for over 50 years, and is now run as a co-operative pre-school nursery by local parents. Has opened for Open Garden Squares Weekend, otherwise private. Has taken part in Open Garden Squares Weekend 5 times, most recently in 2018. The site of the nursery was once part of the adjacent graveyard that is now within St George's Gardens (q.v.). Its separation from the main graveyard arose in 1877 when Thomas Cooke, a surgeon, rented part of the by then disused burial ground and set up a School of Anatomy here. Cooke had spent his early life in America and then Paris, where he studied medicine and became a doctor, moving to London in 1870. He became a Fellow of the Royal College of Surgeons but turned to teaching anatomy. He initially opened his school in Blackfriars, then moved to New Bridge Street near Ludgate Circus, before renting a corner of the St George the Martyr churchyard through an arrangement with the vicar. It became the last private anatomy school in London and the only private school licensed for dissections. A number of buildings were erected in the graveyard in such a way as not to disturb the graves, including a caretaker's cottage, a dissecting room and a cadaver store. Cooke moved to a house in Brunswick Square on the site of the current Foundling Museum, building a connecting passage into the graveyard. The School of Anatomy was evidently successful, attracting up to 100 students a year although by the late 1890s it had begun to decline and in 1899 Cooke died suddenly while giving a lecture. Although his assistant continued to run the school it declined further and by the 1920s was dilapidated and the graveyard overgrown. In 1923 Cooke's son Granville moved with his wife into the caretaker's cottage but he was by all accounts a dubious character with a criminal record. His wife left him after a year and an equally dubious character, John Selwyn Foster, moved into the cottage with him. On 1 April 1925 their dead bodies were discovered in the cottage, poisoned by carbon monoxide fumes from unlit gas, but whether it was an accident or foul play is not known. However, it caused a great scandal. The derelict graveyard was eventually acquired in 1935 by John Cyril Lees Collingham (1866-1936), a wealthy estate agent and philanthropist, and after his death his executors provided the funds to convert the graveyard 'for the welfare of children for all time'. In 1939 arrangements were made with the Bishop of London for the gravestones to be moved to the edges of the site, and its use as a nursery began in the 1950s. Collingwood's obituary in The Times refers to his philanthropy, his support of work with children and the education of young men and women, and also his interest in making provision for public benefit and recreation: 'If a field or a wood or stretch of stream had a special charm, he was ready to contribute towards its acquisition for the public enjoyment'. He was one of the donors to the fund to acquire part of the Foundling Hospital grounds for the public. On the external wall of the garden is a stone plaque inscribed with the word: 'Collingham Garden. The use of this ground for the welfare of children for all time has been bequeathed under the will of John Cyril Lees Collingham who died on May 28 1936. Erected by The Governors of the Foundling Hospital 1951'. In 1964 Collingham Gardens Nursery opened as a playgroup run by the charity Save The Children. When the charity decided to leave in 1983 a group of local parents then set up a co-operative community nursery and it was run with an emphasis on learning through play and discovery of the natural world, a policy adhered to by Georgette Davis, Nursery Manager 1993-2008. Exhibition panels in the Nursery based on research by Ricci de Freitas and Stephen Job; Open Garden Squares Weekend booklet, 2014. forthcoming publication by Stephen Job; Ricci de Freitas, 'Tales of Brunswick Square, Bloomsbury's untold past' (Marchmont Association, 2014), pp.238-242.